Devastated by the loss of both parents in a tragic accident, 18-year-old Chouko Mizushima loses her will to live. After living at the homes of several different relatives, she settles in with a handsome young writer named Kei Mizushima. Kei's a solitary, private person who is uncomfortable around most people and doesn't quite know how to deal with this emotional young woman. At first, Chouko can't seem to do anything right. But her dedication to tending the flowers in his garden leads Kei to eventually accept her presence. Will their growing mutual affection lead to something more? 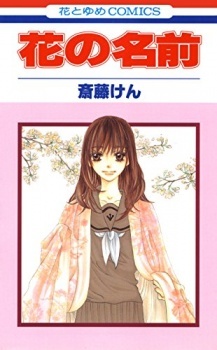 Hana no Namae was published in English as The Name of the Flower by CMX Manga from January 13, 2009 to April 20, 2010. It was amazing in my opinion. it was funny,sad,deep,and it had romance. it had a bit of reading for my taste and some might say it wa dark but it really gives the feeling of that happens to some people. i almost cried but it really somehow made you think and feel so much pity but at the same time have this positive attitude in your head cheering them on. im probably just crazy but it really was amazing. it was bout a girl whos parents died and so she became mentally sick.later we realize she felt like everyone she loved was snatched away from her.Then there was kei who had a greater or equal trials to chockou(her name is something like this) but he becomes so dark that even his friend sees this true hate and darkness eating him away. ultimately though they realize they need each other to wipe away the darkness even if "they may dirty their hands".Overall it was better than inspiring. This manga, I think the overall concept for the storyline was good, but it was not carried out correctly. The characters like Chou and Kei seem to be one dimensional, fitting into well known manga archetypes. What really bothered me about this manga, was the fact that the mangaka does not go into depth about the background of the story, its just "oh Chouko's parents are dead, oh she's living with Kei, oh she's happy now. It's like they go through 2 years in about a chapter and a half. Once this, is over with the pace of the manga turns in the exact opposite direction, becoming slow and almost unreadable. Overall the idea behind the manga seemed to hold potential, but the plot development and characters brought it down immensely. I would not recommend this manga. Hana no Namae is a really amazing story. I picked it up randomly thinking about as another typical naive shoujo story but this manga suprised me with it's deep feelings, and complicate relations between the characters. It describes how hard is to built with power something on a past you wish to forget and struggle everyday with your own feelings. I wouldn't call Hana no Namae depressing, but surely thought provoking to everyone. Hana no Namae is on the heavier side of its genre. Less about love, it's more about facing those past fears that stop people from moving forward. The story progresses pretty quickly even though almost half of it is flashbacks. Due to a great amount of flashbacks not really in linear order, toward the end it was a bit hard to figure out what really happened. However, the narration is beautiful and flows really well nonetheless. The story spans four years I think, from the female lead's high school years to college years. In four volume, I didn't experience any forced jump in the storyline, so I thought that was quite skillfully done. however, I wasn't convinced about Kei's (the male lead) struggle. His sense of guilt that leads him back to the darkness repeatedly wasn't clearly explained in the flashbacks, but then that vagueness did help to evade unnecessary burden of his past on the girl. The only thing I have against the story is that in the end, I'm not sure if everything worked out. I don't think they told each other enough things about their past to move on together. Overall, I recommend Hana no Name to all shoujo fans, no matter if you like depressing stories or not. The setting of the story may seem depressing, but it's really not. The sadness is immense but subtle at the same time.